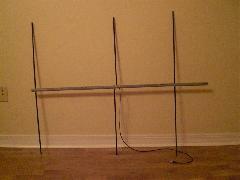 I finally based my antenna design on one found in the ARRL Handbook from 1999. While not an exact replica, my design is very similar. I had decided to go with the through-boom design like the Arrow, as opposed to side-mounted because it is, in my opinion, cheaper. After buying 6 arrows and a quick trip to Lowe's I had a length of #8-32 all-thread and a piece of 3/4" conduit to use as the boom. I marked a straight line down the center of the boom to give me a point of reference, measured out the spacing holes, made sure I was drilling square and level and got to work. After the 3 holes were drilled, I cut 2.5" lengths of all thread for the director and reflector. Since I was going with the split driven element design of the IDX yagi, I would not need threading for the Driven Element, I'd use machine screws for that. Originally I planned to use nylon 8-32 all-thread to go through the boom for the driven element, and feed each side independently similar to the Tape Measure Yagi, but I couldn't find nylon all-thread, and the longest nylon screws to be found came up an inch too short. I cut a length of RG-58 cable and soldered on two o-ring connectors to slip over the machine screws before screwing on an arrow. The measurements came from IDX's lengths, subtracting 3/4" (for the boom) and then divided by 2 to give me the necessary length for each arrow. I used a cutoff wheel and my air compressor to cut the arrows to length instead of a hacksaw. The cutoff wheel leaves a clean cut as opposed to sawing. After putting my MFJ-269 analyzer on the yagi, I found the lowest SWR to be about 1.4 right around the target frequency of 144.490 MHz. 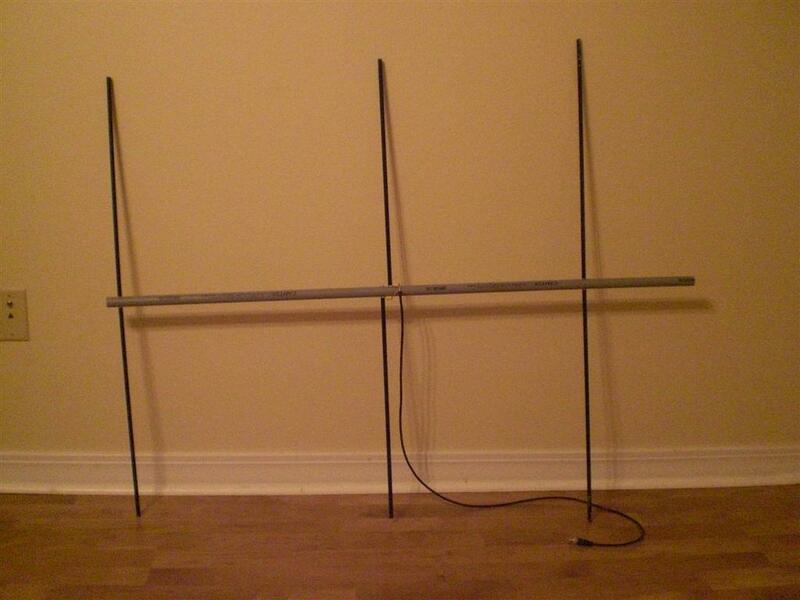 Not too shabby for a first yagi. For those taking my lead, I found it helpful to feed the yagi as perpendicular to the boom as possible. It is also somewhat important for the O-ring feedline connectors to be on the same side of the boom as the arrow. 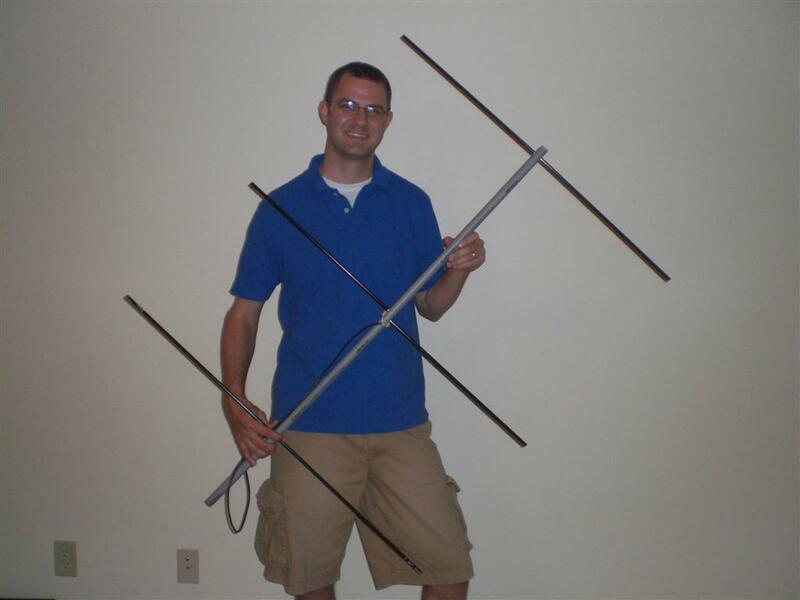 Here's a pic of me holding the 2m yagi. It's a bit larger than the commercially made Arrow. update: I've been asked by more than one person why the split driven element. As you read above, it was semi forced on me by necessity. I needed it to be split for mechanical reasons. the screws going through the boom serve as a match, negating the need for the "hairpin" match from the tape measure yagi or a gamma match. The driven elements being split probably do affect the radiation pattern in the long-field, but perhaps only skew the pattern more in one direction. update #2: Hello Hack-A-Day! Yes, you can talk to the space station and many other amateur radio satellites. update #3: Okay, for those that are interested, I'll be putting together kits if you want. Price to be determined based on what you want/need. You can email me at tommy@neodux.com for more info. Page generated for 54.235.4.196 in 0.02224 seconds.